When first-grader Grace McDonnell got on her school bus headed to Sandy Hook Elementary school Friday morning, she looked out the window at her mother and blew kisses to her. That image will always be in the heart of her mother. Sadly, later that morning, Grace was killed at the school, along with 19 other children. Tonight on 360, Grace’s parents share that beautiful memory of her and so many others. Lynn and Chris McDonnell sat down with Anderson to talk about how Grace touched their lives and the lives of those who knew her. “Grace had such a great spirit. She had a kind and gentle soul. She was the light and love our family,” Grace’s mom, Lynn, told Anderson. “In so many ways she taught us so much,” she added. Grace’s parents say the hardest part was having to tell their older son, Jack, what happened to her. They say the entire family will move forward without anger, because that’s what Grace would have wanted. 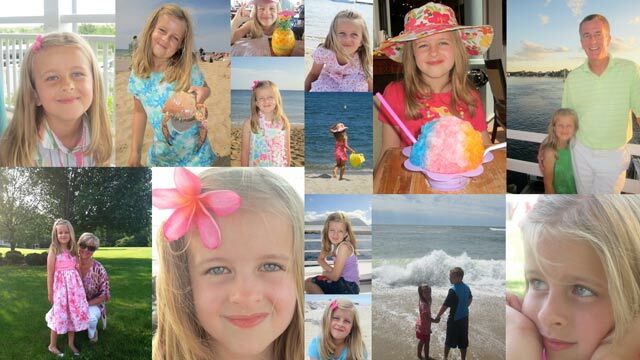 In just seven short years, Grace lived life to the fullest. Her parents say she was happy every day. They say she enjoyed everything: Especially school, the beach and drawing. They say her dream was to live on the beach and be a painter. In honor of her love of drawing, her mom, dad and brother did something special for her Sunday night. They covered her white casket with their own art work, their own precious memories of Grace. They used markers to draw peace signs, along with x’s and o’s and other pictures. “When we walked out of there, there was so much color. It was so Grace,” said her mom. We’ll have Anderson's interview with Grace’s parents at 8 p.m. and 10 p.m. ET. I could not get this interview off my mind God Bless Amazing Grace!!!! My prayers are with her mom, dad and brother. Thank you Anderson........Peace! Thanks so much for sharing Grace with us. What a beautiful little girl. My heart is broken for her family along with all the other victims. I too have a Gracie who is eight years old. The parents gave a beautiful tribute to their little girl. May she rest in peace. I cry everyday for these babies. Anderson and the McDonnell family, thank you so much for sharing this beautiful story. I pray that the peace they have in their hearts will last a life time. Their state of mind comforted me, how amazing is that. I admire their strength! and all of the other Sandy Hook parents. Anderson, you are incredible as an interviewer. Perhaps the tragedies in your own life make you more sensitive than most. I worry about how these parents will cope when everyone goes home. That's when the hard part starts....everyone else's life goes back to normal, but their lives will never be normal again. I hope that we can still be there for them, when they really need us. terrible loss. I will always remember Grace and keep all of them in my thoughts and prayers. She truly is an angel. God bless all of the beautiful children who the entire country will remember and miss. I watched this interview and have spoken with family members about it since. We are all moved by what the family said about their daughter Grace, how they are coping with this tragedy. They present a model for life that we should all hope to be strong enough to follow. Anderson, we are also moved by the way only you can bring us these stories and make us actually feel what is happening. Our thoughts and prayers are with the family. Thank you so very much to the parents for sharing Grace with us! Grace must be so proud of her parents and her brother. We appreciate that you told us about Grace's life. Mr. & Mrs. McDonnell are the bravest and strongest people. Grace was an amazing girl and this was because she was raised by such fine people. She is a beautiful angel in heaven with her friends and teachers where there is no more sorrow and only lasting joy. I hope she will watch over all of us. this family and have never met Grace, she will always hold a special place in my heart. My thoughts and prayers are with the McDonnell family and all families affected by this terrible tragedy. Laura you took the words straight from my heart, Grace reminds me so much of my 6 year old daughter. Such a kind, gentle loving soul.... Her parents are truly inspiring with there faith, strength and sense of love! I watched this report and couldnt stop crying but at the same time finding comfort in knowing that Grace's family have found peace in all that has happened. God Bless the Mcdonnel Family each and every single day. You are always in our thoughts and prayers. what a beautiful sole this parents have and what a beautiful sole their daughter had.. it rips my hearts. when I saw her paintings I cried..I'm an Illustrator and she was so talented and you can see her paintings are nothing but goodness. I'm very sad that these wonderful children are gone, we need more of their kind, not less. all I can do is try and be the better person,so such goodness didn't go in vain. Thank you for sharing your beautiful little girls life! Today I hug my boys tighter, treat others kinder, and have much more compassion then I ever had! Having experienced my own pain I know how precious and short life can be... Grab hold of the fearlessness!! This was truly an inspiring interview. In the wake of such horrible tragedy the McDonnels have showed us all how to move forward from the dark depths of grief into a future filled with hope and not hate. Lynn's final words in the letter that Anderson read were empowering and so very impressive: to move forward without fear for she has already endured the worst so she has everything to gain and nothing to lose. I was incredibly moved by this and feel that if, in her unimaginable pain, she is capable of this then I too can move forward from my grief. You are amazing and brave people to share your pain and perspective with us so that we can heal together in and in honor of the angels and heroes that lost their lives. Thank you. This family is amazing, the report I watched showed a Mom and Dad with awesome hearts. The McDonells are truly inspirational! Amazing strength and courage through this horrendous event! May God bless them always!! Like their Grace, my Noah is also an artist! He loves to draw and is also a peaceful soul! I cannot even begin to imagine the incredible pain and loss they are feeling! Grace McDonnell what a lovely young girl. As her parents described a kind and gentle soul. The angels were there for her and she is a angel now looking out for her friends and loving family. I too have a little beautiful daughter named Grace. My heart goes out to the McDonnell and all the victim's family. IThe story of Grace as told by her parents last night was an inspiration to me. I certainly understand why Grace was the person she was. I have been keeping track of these children, however, Grace's story struck a chord within me. I am a grown up artist that loves the beach and peace signs. Thank you Chris and Lynn for sharing Grace with us. let's make a joint appeal for all efforts to protect our children. Let's get this moving. We have nothing to lose and everything to gain – the lives of our children. The health of our nation! Thank you Anderson for your respectful, dignified, deeply thoughtful and inspiring interview with the McDonell family. I was moved beyond tears to a state of Grace that I will carry with me from this soul crushing tragedy. Several have stated that CNN's coverage has renewed their faith in what news coverage should be and I agree. Thank you Anderson and thank you CNN. My prayers are with everyone affected in this heartbreaking event and my prayers are with those covering the stories with such care and respect. I am trying to limit the intake of Sandy Hook victim coverage at this point- But this interview is the most inspiring example of courage, and God's healing Grace I have ever seen. We should all be empowered by these parents extreme sense of faith. The 'Grace' of God and their Angel who is clearly with them, was very transparent.. This interview really touched my heart. I feel like I know Grace after seeing this piece. And, what incredibly lovely parents who are truly filled with "grace." Grace was a fabulous little artist too! As others have already suggested, it would be a wonderful way to honor Grace by starting a fund through selling copies of her artwork. Thank you for sharing and thank you, Anderson, for a beautiful tribute to a beautiful little girl. Anderson, My husband and I watched your interview with the McDonnell family and were in total awe of their strength and positive nature in the face of this horrible tragedy. I admire them so much for this and seeing their smiling faces and resolve to allow only love in their hearts makes me want to strive to be a better person myself. They truly have such an inner peace about them and it was clear that as blessed as they were by Grace, that beautiful little girl was equally blessed to have such a wonderful example in her life. Please be sure to let them know how remarkable they are. I will continue to pray for them and all the victims. I would like to comment on the story on last night with the McDonnell family. As a mother I do not think I would have had the strength that Mrs. McDonnell showed in sharing what has happened to her family. God Bless her and her family as difficult times are still ahead but hope she can hold onto the strength she showed. Grace was a beautiful little girl and I'm sure her star is shining brite. I watched some the of interview just now and the tears fell . so sad yet so beautiful . these parents are speaking out for their children who had short lives but impactful lives. so sad for all the little siblings left behind . so sad that they have to grow up and tell their own children one day how they had a brother or sister. the thought of that is so sad . what a beautiful beautiful little girl Grace .all these children are soo beuatiful . beautiful little babies just sitting in a classroom with their friends trying to learn and have fun. how american and innocent is that picture . The first time I saw the pictures of all children who loss their earthly life I was devasted and then Grace's picture came on and it was like a light around her maybe because like alot of us who love the song amazing Grace I felt comfort. Then I watch the interview with The Mr and Mrs McDonnell and they were showing Grace's colorful drawings and I was so amazed at those beautiful drawing. Words will never express Grace as much as the drawing will. I have never done a comment before but this one was inportant to me express how my heart goes out to everyone and most of all to the McDonnell family for sharing their Grace with us. I also thought that if the family ever decided to print any of Grace's drawings I would love to have one to hang in my home as a reminder of all these beautiful children. I loved the fish. I watched this program, and I cried my heart out. Such an exceptional girl, as all other victims were. I do not presume to understand the pain and grief the families are feeling, but it must be unbearable since I half a world away feel such pain inside. Just typing this brings tears to my eyes all over again. God bless and I will keep them all in my prayers.